Nixduino is a convenient and affordable solution for an open platform to run Linux. 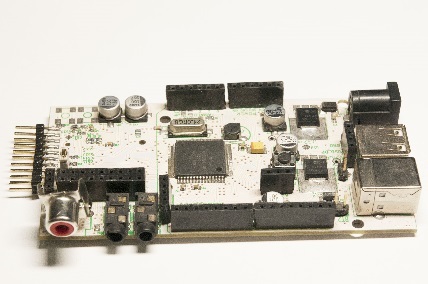 Developments of Nixduino were used in the project Celebrity. Application options vary, since you can connect keyboards, headphones, flash-drive and etc. For example, one of the developers used Nixduino as an mp3 player. As a prototype there were realized devices for building into the automobile headrests, which are adapted for playing various media files. If you plan to introduce some extensions of the architecture - board is completely compatible with Arduino. Nixduino is a convenient and affordable solution for open platform to run Linux. Application options vary, since you can connect keyboards, headphones, flash drive and etc. For example, one of the developers used Nixduino as an mp3 player. Also as the prototype the device has been embedded into the automobile headrests, which are adapted for playing various media files. The hardware task includes developing of schematic diagrams of the printed circuit board. 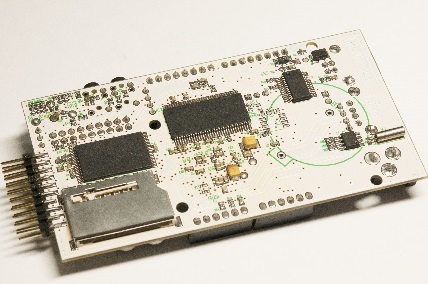 It was initially supposed to make a double-layer board, but later it became a four-layer to ensure a high quality of power supply of the processor IMX 233 (TQFP). With the help of a USB convertor based on UART ( FTDI ) console access to Nixduino is performed. Build of Linux with appropriate settings and additional tools.